Featuring just 4.33 inch of length, it is so portable and lightweight that it can be taken everywhere you go. easy to use, just plug and play. so convenient for your business and life when you are travelling. ★Plug and Play: The upgraded iPhone OTG adapter is much easier to transfer photos or videos from your camera to your iphone or ipad. Easy to use, plug and play, NO APP NEEDED. Your ipad or iphone will open the photos app automatically by connecting this adapter,and you could choose photos or videos you like to import. 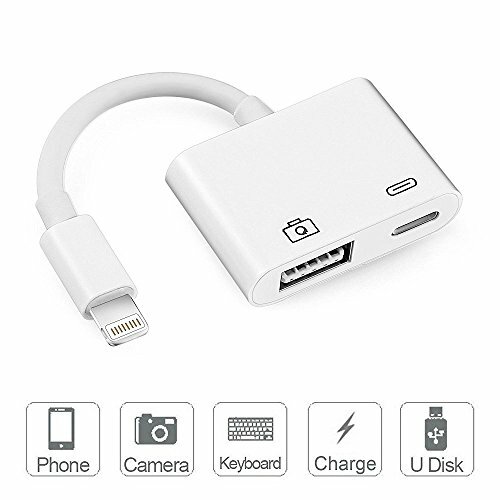 ★Multi-function Camera Reader: Connect the lightning USB 3.0 adapter to the keyboard to enjoy the faster typing speed as a computer when chatting or typing with your iPhone or iPad, and can charge your iPhone at the same time! ★High Data Transfer Speed: Transmission is 14MB/S~16MB/S, Faster transfer of photos and videos between two iOS devices at USB 3.0 speed, A great choice for copying photos or videos to camera in a short period of time. ★Support photo & video formats: The Lightning to USB 3.0 Camera Adapter supports standard photo formats,including JPEG and RAW,along with SD and HD video formats,including H.264 and MPEG-4. ★More Compatibility: Support iOS 10.3 and Later, it means it fit for iPad mini Air Pro and iPhone X/8/8Plus/7/7Plus/6/6s/6Plus/6s Plus/5/5c/5s. If you have any questions about this product by Adwox, contact us by completing and submitting the form below. If you are looking for a specif part number, please include it with your message.